Watch this summary video on bone broth for your digestive health. 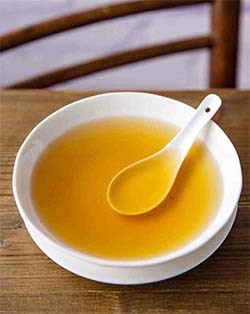 Bone broth is the result of cooking animal bones slowly in a mixture of spices, vinegar, and salt. During the slow cooking process, minerals and proteins are released from the bones. Bone broth is a traditional everyday food. Throughout human history, we have consumed animals from “nose to tail”. This means that we consume every edible part of the animal, not just the skeletal meat. How does bone broth heal the digestive system? During the cooking process, proteins become denatured (broken down) which forms a gelatinous structure. Gelatinous may sound unsavory, but it does refer to gelatin. The same gelatin we make Jellos with. The gelatinous structure is critical to maintaining a healthy mucosal barrier. The mucosal barrier protects the surface of our digestive system. Without a healthy mucosal barrier, the surface of our digestive system can leak proteins into the bloodstream. This is known as Leaky Gut Syndrome. High intestinal permeability increases gastro-intestinal inflammation. Healing a leaky gut helps to reduce both local gastro-intestinal inflammation and pain due to food intolerances that develop as a result. A leaky gut causes both local and systemic dysfunction. Leaky gut syndrome is currently considered a “precondition”, which leads to food intolerances, autoimmune disease, heart disease, and diabetes . My name is Mark Van Otterloo. I have my doctorate in acupuncture and oriental medicine with a focus on integrative medicine. My practice focuses on both functional and traditional medicine. At our Lakewood office, LoTurco Chiropractic Group, we see patients with chronic digestive issues, and we recommend bone broth as a food therapy. “Like” us on Facebook for future 2-minute summary videos. Thank you for stopping by!